The latest results from the Ipsos MRBI JNLR survey covering the period October 2009- September 2010 were released today (Thursday 28th October 2010). The survey results indicate that 85% (-1) of the adult population was listening daily to a mix of national, regional, multi-city and local radio throughout the country. The weekday reach figure for Newstalk increased to 8% (+1) while figures were unchanged for RTÉ Radio 1 at 24%, RTÉ 2FM at 14% and RTÉ Lyric FM at 3%. Today FM recorded a figure of 13% (-1). With regard to market share, an increased figure of 53.8% (+1.3) was recorded for any multi-city/regional/local station in the 7a.m.-7p.m. period. Newstalk increased its market share figure to 4.1% (+0.1) while RTÉ Lyric FM retained a share figure of 1.6%. Small decreases were recorded for RTÉ 2FM at 8.7% (-0.6), RTÉ Radio 1 at 22.1% (-0.5), and Today FM at 9.3% (-0.3). Spin South West increased its weekday reach figure to 21% (+2.0) and also increased its market share figure to 10.9% (+0.9). Beat 102-103FM, serving the south-east, increased its weekday reach figure to 20% (+1.0) and also increased its market share figure to 12.3% (0.8). In the north-west region, i102-104 increased its weekday reach figure to 20% (+1.0) and increased its market share figure to 14.7% (+1.1). In the north-east/midlands area, i105-107FM increased its weekday reach figure to 7% (+1.0) and increased its market share to 5.1% (+1.3). 4FM, the multi-city service, maintained a weekday reach figure of 3% (same) and recorded a market share figure of 1.9% (-0.1). Weekday reach figures remained the same for several local Dublin stations: FM104 at 19%, 98FM at 14%, Spin 1038 at 14% and Dublin’s Q102 at 13%. The other stations, Country Mix 106.8 FM and Phantom 105.2, recorded figures of 3% and 2% respectively. In terms of market share figures, increases were recorded for FM104 at 11.5% (+1.8), 98FM at 11.3% (+0.4), Dublin’s Q102 at 11.2% (+0.9) and Spin 1038 at 6.5% (+0.2). Country Mix 106.8FM recorded a figure of 3.1% (-0.2) and Phantom 105.2 recorded a figure of 0.9% (-0.2. Cork’s Red FM achieved a reach figure of 21% (+1) and increased its market share figure to 11.3 (+0.9). The combined reach of Cork’s 96FM/C103 remained at 48% (same) while a share figure of 43.5 (+0.2) was recorded. On Saturday 9th October 2010 I took part in a full-scale testing process for the newly completed Terminal 2 at Dublin Airport, with 2,000 volunteers descending on it at the same time to check in, navigate their way to gates, and then arrive and reclaim baggage in order to check how the building and its staff would react to peak-flow conditions. It was both fun and interesting to get to experience this huge piece of new infrastructure in advance of its opening, and to observe the testing process itself. Note: Photography was strictly forbidden on the day, so all images here are from the DAA’s publicity gallery, and were not taken during the testing process. 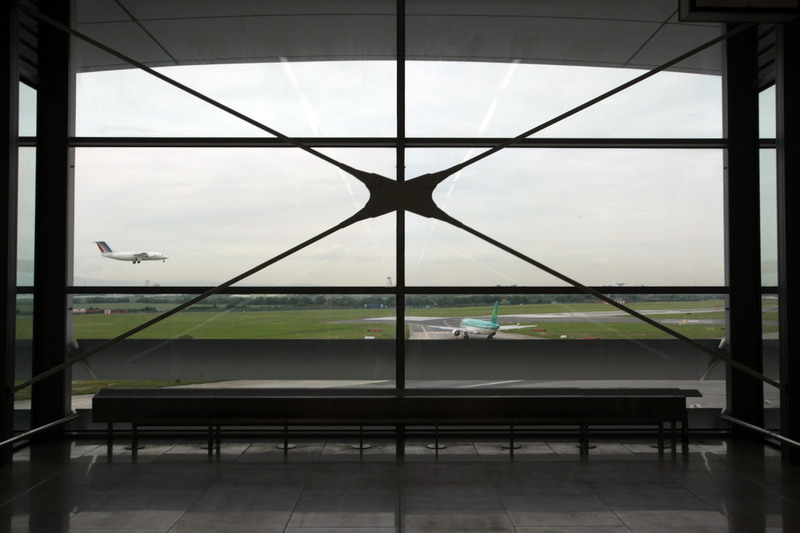 The glass-fronted Terminal 2, a new shape at Dublin Airport. Spending a day in airport queues and walking corridors without the reward of getting to go somewhere at the end of it might seem like a vision of hell for many people, but I’ve always enjoyed travel, and take a keen interest in the infrastructure of transport and how it has changed over the years. 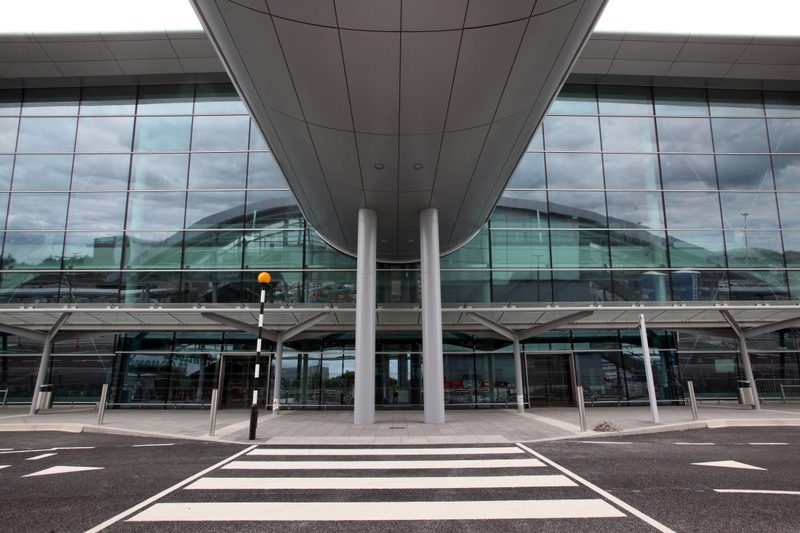 So taking part in the Dublin Airport T2 trials and getting an early glimpse of a building which will be very much part of my future (I travel by air from Dublin at least once a month) is reward enough. As I go through my day as a tester, I get the impression that the other volunteers feel similarly – they are all bright, alert, and interested in what is going on around them. How this influences the results of the trial is something I will come back to later. Arriving at Dublin Airport for the trials, I am quickly guided to Terminal 1 (the existing building) for a registration process, that takes place in the infamous “Area 14” – an underground check-in zone built to ease the worst of the overcrowding in T1 a few years ago before the downturn in traffic with the economic slowdown. This pit-like area was not popular and does not get used so much now, but it is self contained and ideal for keeping us guinea-pigs apart from the regular travelers. Registration is quick, my passport is checked, and then I am issued with a new identity and papers outlining my agenda. They also issue me with a bright green badge to identify myself as a tester, plus a Danish pastry and a carton of apple juice. I am Mr. S Beagle, heading to Terminal 2 to catch Air Lingus Flight EI9995 to London Heathrow, departure time 1330. There would seem to be a lot of time, as it is only 1015, but the instructions state that I must check in for the flight 3 times, so that with the 2,000 volunteers they can stress-test the terminal with 6,000 virtual checking in passengers. It seems a big moment for me as I leave Terminal 1. This building, and the smaller ones it grew out of have been a huge part of my life over the last 40 years, and a focus of many childhood memories. As an Irish person growing up in the 60s and 70s, emigration was part of our national identity, and it seemed perfectly natural that life revolved around a succession of farewells and greetings at airports and ferryports to siblings, aunts and uncles who were heading off to live on the other side of the world, or coming back for brief holidays in the “old country”. My oldest brother moved to Canada when I was just 9, my sister followed shortly afterwards, there were relatives constantly arriving and departing from the States and Canada, not to mention the UK. Dublin Airport, and the rituals of seeing off, or meeting and greeting, were a huge part of my youngest days. It was at this airport, as a young child in the late sixties, or perhaps very early 70s, that I saw my first ever automatic sliding doors. I was spellbound, not that they could open and close by themselves, but at the fact that they magically knew when a person wanted to go through them. I begged my parents to let me go outside, where I walked up to the doors again and again to see them open for me. It was here also where I saw one-way tinted glass for the first time. This was amazing too, a window where you could look out at the cars and taxis dropping off passengers, but if you went outside, you couldn’t see in! That was fun to play with too, and I went out and in and out until my dizzy parents told me to stop. They were simple times, and it didn’t take much to keep me excited or amused in those days! Waving people off as they got onto a plane was another part of the ritual. It was possible in the 60s and 70s to get a clear view of the tarmac and of everyone boarding the places from the normal public areas, and most people would watch the flight that their relative was on actually taking off before leaving to go home. I can remember a long, slightly sloping corridor with big windows looking out at what we now call “airside”, and watching out for my brother or sister or whoever to walk out across the tarmac and climb the steps up onto the plane. Quite where that corridor with its view has gone, I don’t know, it is probably lost somewhere is the maze of multiple rebuildings over the years, and these days you can’t really see airside from the public area, and even if you could, the airport is so spread out, the planes are too far away to see individuals. All of this goes though my mind as I walk out of Terminal 1, through sliding doors now taken for granted, and leaving a wealth of personal history behind me. The route to Terminal 2 takes me through the coach station, and along a glass covered walkway, Staff in orange jackets are positioned at regular intervals to keep the badged herded on the right route, and to keep the unbadged away. The new terminal is very impressive from the outside, but not so awe-inspiring inside. I check the screens for my flight, and notice that there are a dozen or so virtual flights from Terminal 2, all due to leave within the space of an hour. I am handed a trolly with two enormous suitcases, and join the longest check-in queue I’ve ever seen in my life. This is the most boring part of the day, and I have to do it three times. The queue for check-in takes a full half hour, and each time I go through I get a different coloured sticker on my badge, until finally I have done my duty testing check-in, and am given a boarding card for Flight EI9995, leaving from Gate 422. I know from peeking at the forms, that one of the things I will be asked is how easy it was to find the trolly drop-off. Well, even pre-warned, frankly it is not easy, there seem to be no signs, and it becomes apparent that you have to go back outside the building to drop off the trolly, Dozens of people are just abandoning empty trollys everywhere in the check-in zone, making navigation difficult. Up two levels of escalators to security screening, I wonder how easy this would be with hand-baggage, and why the check-in wasn’t put on the upper level instead of ground floor. Security screening seems quick despite the very heavy flow of human traffic, but despite putting everything, including my badge, in the tray provided, I still manage to set off the metal detector, and get the most thorough body search I have ever had at an airport. There is no part of me that has not been patted down, touched and prodded. The searcher is relaxed though, as he knows that in this environment, no one is a real threat. Likewise, everyone going through security is good humoured, and there is none of the usual tension and grumbling. Once through security, I pass into the retail area, and as always, the first thing I do is to re-check my flight on screens. The flight is now indicated as leaving from gate 415 rather than 422, and I wonder if any of my fellow testers will be caught out by this one. The shops and food hall are all closed of course, so it is straight on to the gates for everyone. This part of the testing process does not reflect reality, for it gives the inattentive no chance to be distracted lingering in shops and bars, and to leave it too late to reach their gate on time! Departure Gates in Dublin Terminal 2. (this photo taken before seating installed). Arriving at the Departure gate and settling down in a seat there begins the most surreal part of the day. It is now 1215, my flight is due to depart at 1330, I’m sitting at a departure gate along with a whole bunch of other people, and the screen over the gate says “EI9995 London LHR 1330”. It is just like any of the dozens of times I have waited for a flight recently, and I am indeed waiting for something to happen at 1330, as I will need my next set of instructions. But I know that none of us are actually going anywhere, despite the stimulus to my brain telling me I’m about to board a place. Bored, I go for a wander, heading down towards the very end at Gate 426 where there is a fine view of the runways. I stand there for a while watching take-offs and landings, and thinking back to how I used to do this in my childhood. My old 1960s corridor with the great view may be long lost in the mists of time and redevelopment, but now there is a new one to replace it. Food is being served to the volunteers at the gates, tea, coffee, sandwiches, crisps and fruit. Free newspapers are provided too. Back at my own gate, I study my fellow travellers. There is a good mixture of young and old, lots of families with young children, who seem to be taking the long wait in their stride, though there are the inevitable couple of young children being told off by an airport policeman for endlessly running down an up escalator. There are lots of people with reduced mobility too, several in wheelchairs and a young woman on crutches. No one seems to be minding the wait, and everyone looks interested in what is around them. A group of Air Lingus ladies turn up, and prepare for the time when they will be asked to board us. But then, they get a call, part of the test which is testing them as well as us. Our flight is to be cancelled, and they must rebook us onto another one at 1415. This is where things get difficult, we quickly form a queue to them, but they can’t get their terminals to work, and after a bit of a delay they have to process the whole flight of us, about a hundred people, one person at a time, printing new boarding cards, and sending us off to Gate 413. They look suitably harassed, but the passengers are taking it in their stride, and even joking with them. Now Mr. Beagle is set for EI9991 at Gate 413, and such was the delay in rebooking, that I don’t have to wait long for this. Before we board, there is a quick visit from a DAA lady who thanks us for our time, and a raffle in which I don’t win anything. As we go through the gate to board our virtual plane, we are handed a new set of instructions as arriving passengers, and are escorted up an escalator to the arrivals gate, from where it is an easy walk to immigration. I am a Non-EU passenger this time, which is lucky, as the queue at the EU passport Garda desk is a mile long, while mine is empty. The passenger ahead of me tells the Garda how nice it is to come to his country, but gets no smile in return, just a curt “you can go now”. After collecting my luggage (you just pick any bag) I decide to add my own twist to the proceedings, and go through the red channel in customs rather than blue or green. They are not prepared for this, and there is nobody in the red zone to ask me what I am bringing into the country, though I am stopped after I leave the red channel by a customs man who wants to know why I went through it! By the time this is all done, it is around 1445, and I hand in my notes, and get given a goodie bag, containing a cheap plastic luggage tag, and a box with two chocolates. Hmmm. 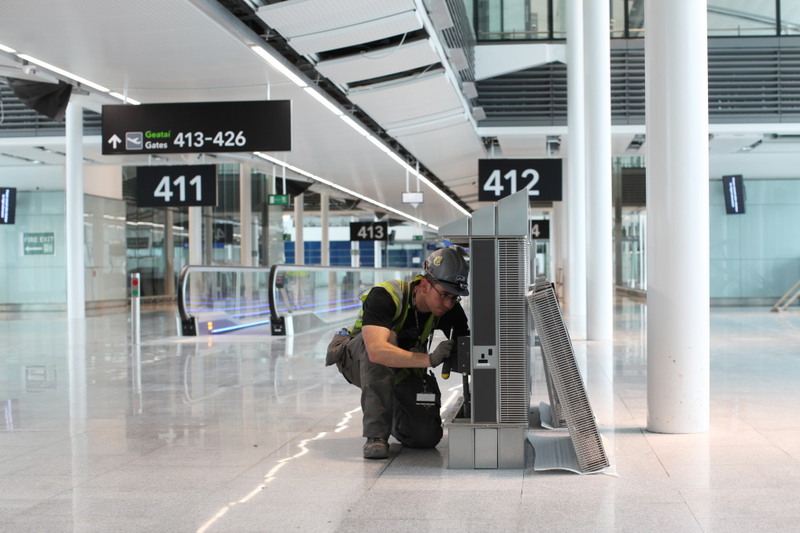 I would have preferred a little cert, or even a keyring or something engraved with the date – something tangible to say that I had been one of the people who tested Terminal 2 on this date. So, a very enjoyable day, and a good memory. I don’t think I’ll ever fly from T2 without remembering that I was there before it opened, and raising a glass to the mysterious Mr. Beagle. As for the testing process itself, I can see how useful it must be to have a decently large number of real people all using the facility at the same time. I am sure much was learned from it, and it also served a legal function in proving that the security screening functioned properly, thus clearing the DAA to announce that the terminal will open in late November. But thinking of Heathrow Airport and its Terminal 5 debacle, I am sure that it must have been similarly tested. So what went wrong? Well, the one thing that any regular passenger cannot fail to notice is how many other passengers are . . well, lets say “inattentive”. You’ve seen them all as I have, the people who hold up the line going into screening because they didn’t realise they needed a boarding card. The ones who can’t understand why they need to put metal objects in a tray. The ones who go to the bar and forget their flight until 5 minutes before due, and who then can’t work out which way leads to the boarding gate. The test yesterday was good for simulating numbers, but by virtue of self-selection the people who volunteered to give up their Saturday to do this were interested, aware, and invested in getting it right. Come opening day, such people will be just a minority amongst the regular, hurried, stressed, inattentive, forgetful . . and that’s when the real test begins! Over the past year I’ve been signing up to do things a little off my normal track, saying “yes” to things I’d normally say “No” to, or just trying things I’ve never done before in my life. So far these have included taking part in a group naked photo-shoot, taking a hot-air balloon ride, and drinking my first ever (and not to be repeated – yuck!) pint of Guinness. 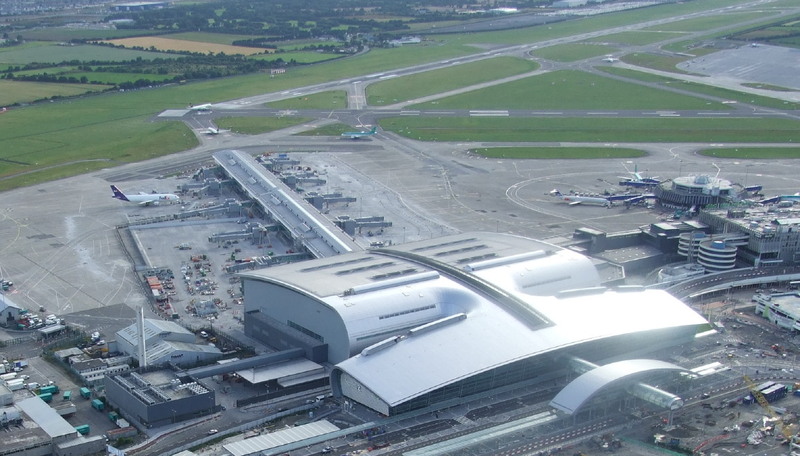 I’ve always been interested in both transport and infrastructure, so when DAA (Dublin Airport Authority) put ut a call for human guinea-pigs to take part in a full scale test of the almost finished Terminal 2 at Dublin Airport, I jumped at the chance. OK, so I have to spend the bulk of a precious Saturday queueing and waiting, while not actually going anywhere, but on the plus side I get to indulge in constructive criticism, and get that little jolt of “walking into the future” that I always feel when using a big new piece of infrastructure for the first time. And this time I am going into the future in a sense, by getting to experience something that is not actually open yet. This article walks you through the new terminal and reviews it from my point of view as a regular traveller. Photography was not allowed on the day, so images used here are from DAA’s publicity file, and were not taken during the test. Terminal 2 presents a modern and snazzy image on the outside, though inside it is clean and functional rather than awe-inspiring. After approaching through a long glass-covered walkway from the old terminal and the bus station, you enter at ground level to a large check-in hall. All of the check-in desks are located in a straight line along the rear wall, leaving the whole of the floor space for circulation and marshalled queues. When in operation, there will be on 4 or 5 different check-in queues, with, for example, everyone for Air Lingus in one large queue feeding into perhaps 15-20 check-in desks. This area is very bright due to the glass walls on three sides and a lot of glass above too. It did get filled to capacity very quickly during the trials, so it will be interesting to see how it will cope on a busy bank holiday Friday or a normal Saturday morning. When you have checked in, you need to to go upstairs to departures, and to do this you have to go back to the outer edge of the building to access the escalators, crossing the flow of people arriving in after you to join the check-in queues. The escalators take you up to the mid-level arrivals floor, where another set of escalators take you up to the Departures area. I’m not sure why they have put check-in on ground level and arrivals above it instead of the other way round, but presumably there is a reason. My advice when using T2 would be to check-in online if possible. On the other side there are tables for putting your stuff back together, but possibly no seats (none were installed as of yesterday, but there was an area which looked as if seats might be installed – these are useful after screening if you need to sort stuff out, but back on shoes etc). From here you pass straight into a large oval concourse, with lots of shops all around you (most were not complete during the trial, but there was the usual big duty free shopping area for drink/perfume/gifts, a chemist, a W H Smith (strange to see that in Dublin!) and various fashion stores. A set of escalators leads up to a Food Hall, but this was closed off, so I can’t comment on size, layout or choice of eating options. Continuing to our terminals 4xx gates, at one point you emerge from a covered area into a glass-sided landing before descending a set of long escalators, and just at the top of these you have a superb view airside. 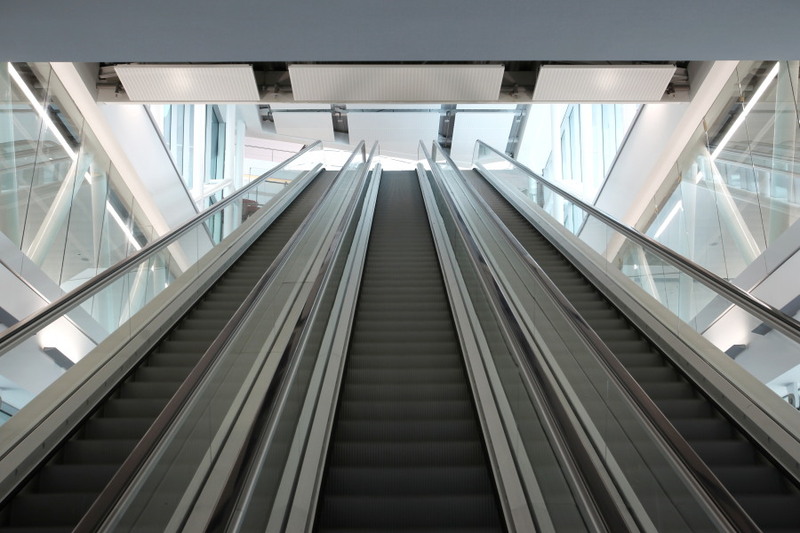 The escalators take you down two levels, and pass through the arrivals corridors in a glass-encased box. You are now at the departure pier, still above ground level. The gates (407-426) are set out on a long straight line as you walk out the pier , odd numbers to the left, even to the right. 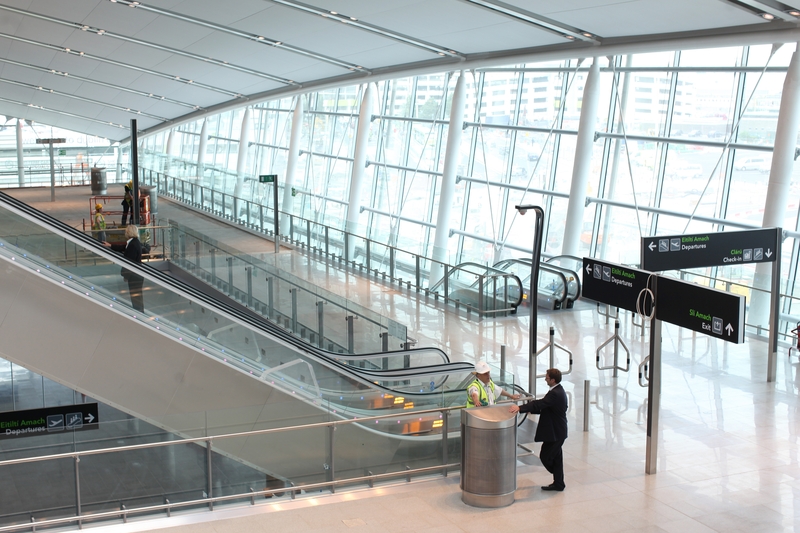 (Gates 401-406 are in a different, ground level section, reached by further escalators from this point – obviously no airbridges at those gates). The area is spacious, there are frequent toilets, and the usual amount of seating per gate (i.e not enough – about half a planeload). There is no indication at the moment of any catering/coffee type kiosks here, but surely these must be added before opening. An interesting thing, this departure pier projects out into the airside area far more than any of the others at Dublin Airport, and if you go all the way to the end, at gate 426, the pier ends with a large, unobstructed window area giving you a view in three directions across the airport, quite close to the end of one of the main runways. It is quite the best view of the airport that you will get from any public area. Terminal 2, showing main building, and in the background, the departure pier projecting out towards one of the runways. The view from the end is very good. On arriving back from your flight, the process is very straightforward, and few changes of level are involved (if an airbridge is used). You walk straight along the pier, into a large passport/immigration check area, and straight into baggage reclaim. This area is like any other I have ever used, and you exit from this into the public arrivals area. Taxi and bus services can be accessed via a covered walkway. My overall verdict: nice, bright, modern, nothing stunning, but functionally very good, except perhaps for the check-in to security routing. OK, so I’ve been very remiss on blogging over the summer. Life has been running at such a breakneck pace it has been difficult to fit everything in. Though I do manage to stop occasionally to enjoy the sunrise. But I promise to catch up over the weekend with some fresh pieces. I’ve done the third of my “10 things” and am about to do the fourth tomorrow. I’ll try to catch up on all of this, plus what is happening in my writing and radio worlds. As for today, in my other guise as IT Management Guru, I’m about to attend a class on “Paradox Management”.